Today, January 18, 2019 is my Dad and Mom’s 64th wedding anniversary. When I think about that I am in wonder and amazement! How can two people live together for 64 years…and still love each other and, even better, still like each other? When people ask my mom what has been the secret of their successful marriage, she will answer, “He brings me coffee in bed every morning.” As I reflect on growing up and watching their relationship, I realize it is SO much more than getting coffee in bed. Mom has been the one to lift Dad up and make him feel special. When Dad would achieve or accomplish something she would encourage him to share it with friends and family. Even to this day when we talk on the phone she will say, “Your dad has something to tell you.” Another thing she does is to make birthdays and holidays special. She receives great joy from looking for and finding just the right gifts for people…and if she can find it on sale that is a bonus because it means she can buy another gift! Growing up I remember they laughed a lot. They would laugh with each other and even at each other. I believe this is one of the most important elements that held their marriage and relationship together. When you do not take yourself and life to seriously, you then have the ability to see the humorous aspects of yourself and your family and your life. To this day my parents and our family will tease and joke and laugh…about all kind of things. Sometimes I hear them laughing in their bedroom as they get ready to turn in for the night. 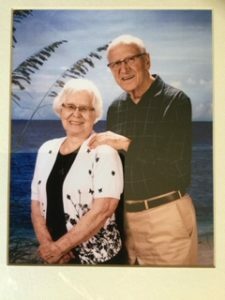 So here are a few secrets to successful marriage from a couple who has done it for 64 years…deny yourself, make the other feel special, and take the time to laugh and see the humor in life. Dad and Mom, I wish you many more years of marriage together. What a joy and privilege to celebrate another anniversary with you!